I did not purposely go out of my way to try a shape that was not in my comfort zone. Save your awards and applause for someone who deserves it. I bought this dress off of Poshmark and the seller's photos were cut off so I stupidly assumed that it was an A-line cut. If you saw these pictures, you would assume as much too! Or maybe it was just wishful thinking and not seller's fault at all. 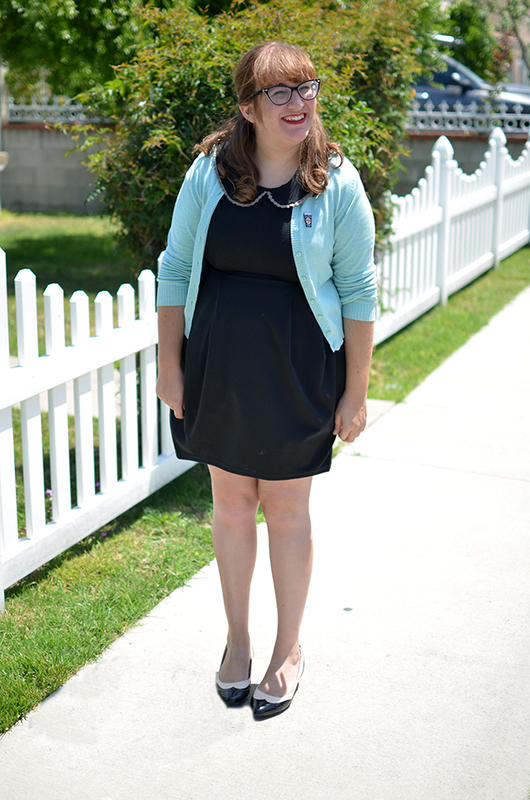 Either way, I chalked it up to my own inability to pay attention to listings and accepted the dress. That said, I did decide to try it anyway, so I guess I deserve some sort of praise? Right? Probably not, but I am pretty proud of myself for wearing it anyway, even if it still is pretty flattering and super tight as I had feared. Turns out, I like it! A lot, actually. 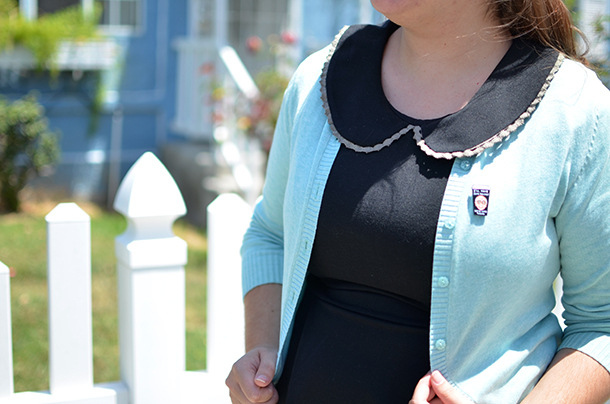 I'm not a big fan of puffy sleeves (hence the cardigan), but the shape? You know, I think I can get behind it. 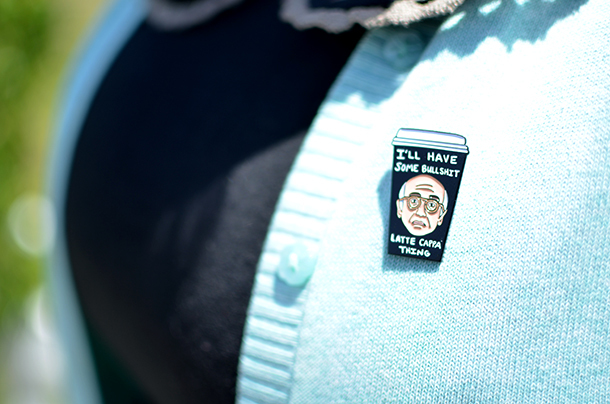 I also paired it with this new Larry David enamel pin that I scored from Bee & Mae, so that doesn't hurt either. I had been eyeing this pin for months, and I finally decided to just get it. I only watched through all of Curb Your Enthusiasm last year (before that I had just seen an episode here or there), but I obviously loved it enough to know that a Larry David is necessary. Bee & Mae must have the same exact taste in pop culture as I do because every single pin she makes is right up my alley. I may have also gotten the Bob's Burgers/X-Files one too. It's too good. Side note: Bee & Mae's shop is closed right now, but it will be reopening this week if you want to snag one of these pins too! 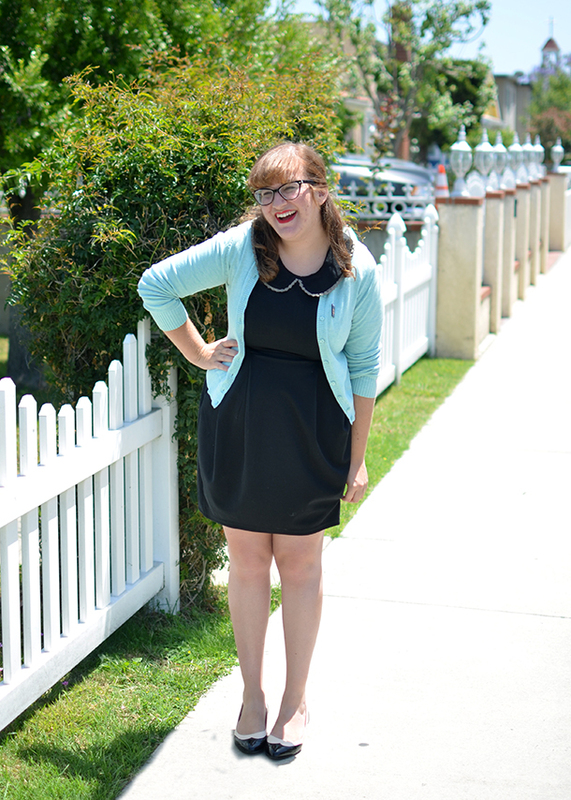 This post isn't sponsored (I'll always make that clear in the outfit details if it is), I just really like her pins and have a feeling you will too. I think you look amazing! And well done you! I completely understand. I always go for A line and when I don't I need to prepare mentally for like a week or so. So I think it's super impressive that you wore it, and you look fantastic in it! I love you in an A line skirt but must say... this is a good look for you. It makes your legs really long and you seem taller overall.